Michael DiBernardo distinctly remembers the first time his parents took him to Sears. He was around four years old and the first stop was the top of the stairs. DiBernardo wasn’t the only one mesmerized by the mural by G. Hunter Jones, which dates back to 1966. 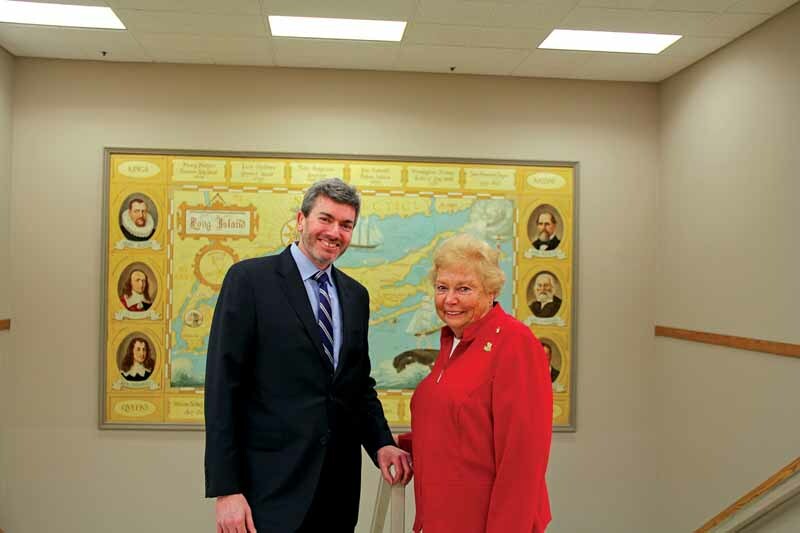 For years, shoppers have stopped at the top of the stairs to gaze at the 20 by 15 foot mural, which depicts Long Island and some of its most notable residents. And while come April, Sears will be no more, that doesn’t mean this local landmark will meet the same fate. 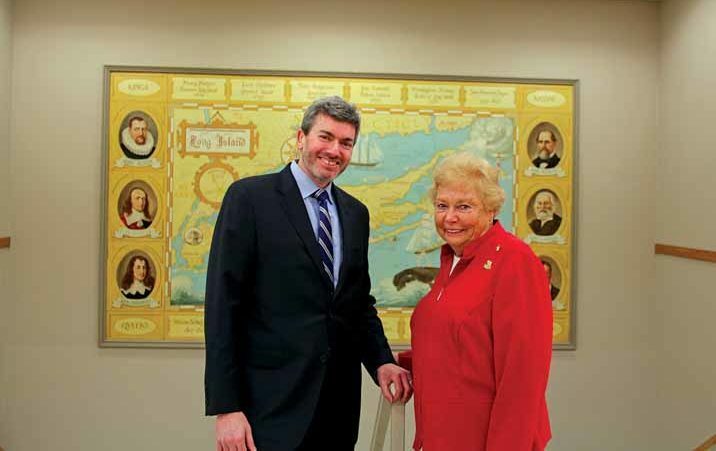 Larry Rose, managing principal of The MichelisRose Group which is redeveloping the Seritage property, with Legislator Rose Marie Walker in front of the Sears mural. Town of Oyster Bay officials joined with Nassau County legislators, the Hicksville board of education president and executive director of the Oyster Bay Historical Society last week to announce they are working with Seritage Growth Properties—owner of the 26-acre site where the Hicksville Sears is located—to find a new home for the mural. 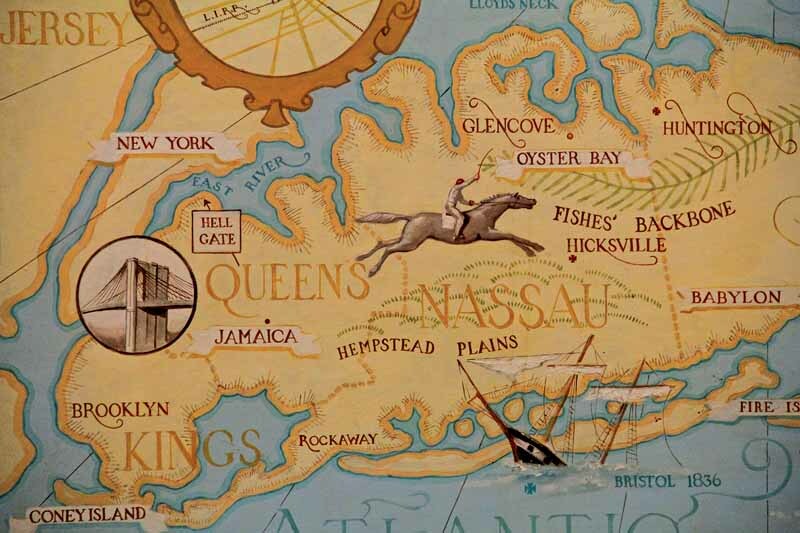 Murals in other Sears locations have been safely moved and preserved, and Seritage is funding a feasibility study to determine how to best save and transfer the Hicksville mural to another location. At the top of the list for possible sites are Hicksville High School’s lobby or auditorium, the Town of Oyster Bay Hicksville Athletic Center, the Town of Oyster Bay’s Ice Skating Rink in Bethpage and the Life Enrichment Center in Oyster Bay. 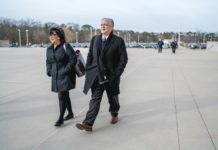 “While the final home is still being worked out, one thing is for certain, we want to preserve this work of art, keep it home in the Town of Oyster Bay and make sure it is moved in an appropriate way and make sure it is on display in a location for all our residents to enjoy,” Saladino said. More than just an interior decoration, the mural is a picture of history, depicting notable area residents such as Henry Hudson, Walt Whitman and Theodore Roosevelt on its border, in addition to marking significant events, such as the date of the first rail road, building of the Brooklyn Bridge and discovery of Long Island. Legislator Rose Walker, a lifetime Hicksville resident, shared memories of coming to Sears with her parents and looking at the mural as a child. 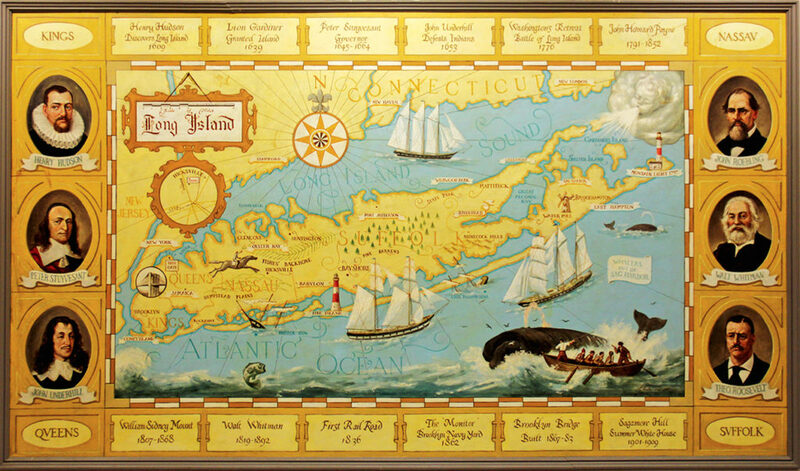 Entities from East Hampton and Islip have expressed interest in providing a future home for the artwork, however, local officials have stressed they want to keep it in the Town of Oyster Bay at a place with high foot traffic. That’s good news for DiBernardo and the others who have grown to love the mural over the years.